Today is the Holiday Recipe Club Blog Hop is hosted by Erin from Big Fat Baker. Today’s hop we had a choice of ingredients, either spinach, eggs or carrots. I debated about egg dishes since I love eggs, but I decided on using carrots. I love these hops because I get to put my thinking cap on and try to come up with a different kind of dish. 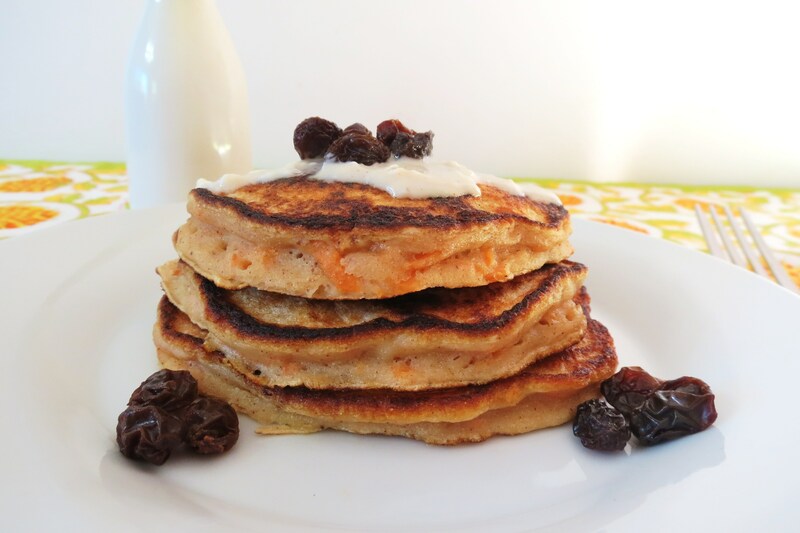 During the last hop I made pistachio pancakes, which I just adore, so this time I thought, hmm, carrots in pancakes and therefore Carrot Cake Pancakes were born. I actually made this recipe twice, since I didn’t think the first ones were not carrot cake tasting enough, so with a few modifications to the recipe, I came up with these bad boys. I am really happy with the second set of pancakes. They came out thick and had more shredded carrots in them. I changed them up by adding yogurt, cutting back on the milk and adding brown sugar to them. Perfect!! 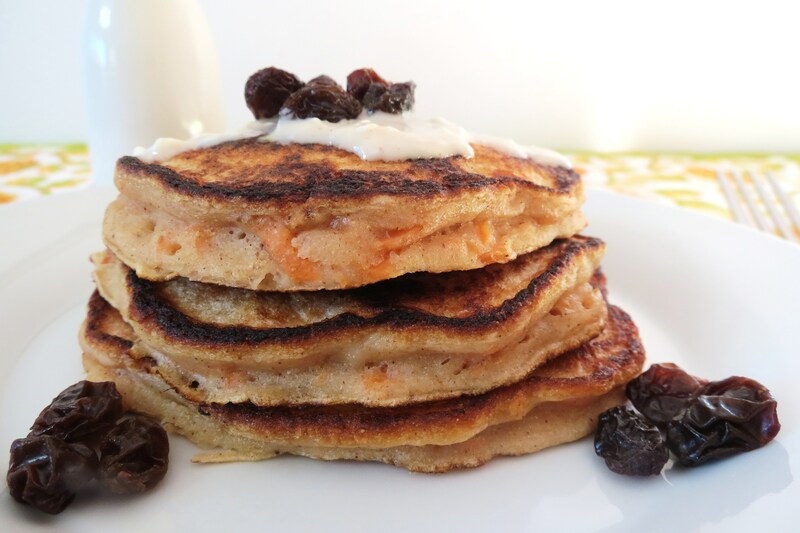 If you’re a carrot cake fan, you will love these! I made a cream cheese frosting, which was fat-free cream cheese, milk, powdered sugar, vanilla extract and cornstarch. The frosting was amazing! In the original recipe I kind of over did the topping on my pancakes, but I was having so much fun with it. After all said and done, I felt it was just a little to sweet for me, but if you like sweet frosting than add more to the pancakes. But I will say the frosting was bowl licking good! I am looking forward to the next hop, because I can’t wait to see what ingredients they let us choose from. I wonder if I’ll be able to make pancakes with one of the ingredients? If your interested in joining the Holiday Recipe Club, you can check out all the information here. You should join, it brings out your creative side using the ingredients they tell you to use. Mix greek yogurt, milk, egg whites & vanilla extract into a small bowl. In a separate bowl combine flour, baking powder, sugar, spices and salt. Mix and add carrots. Combine and whisk till evenly incorporated. Spray a skillet with cooking spray, turn heat to medium, let the skillet heat up and add ¼ cup of batter to skillet and cook till bubbles start appearing through the top of the pancake and then flip. Add cream cheese, powdered sugar, cornstarch, milk, vanilla and cinnamon to a small bowl and whip together until combined. 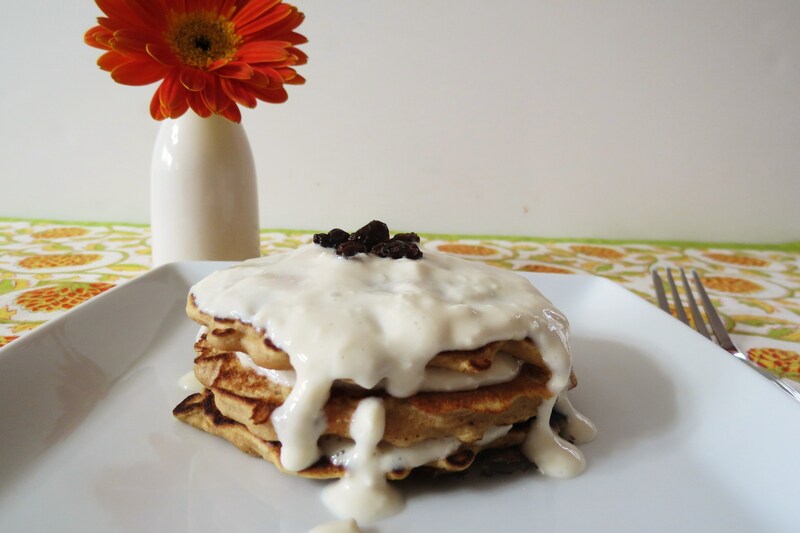 Add cream cheese topping to pancakes. Off to make din din! Have a great day! Oh.My.Gosh! I adore carrot cake and LOVE this idea!!! Super yummy, my friend…and perfect for the HRC! Now those are some tasty looking pancakes! I like the use of Greek yogurt and whole wheat flour. Great HRC recipe! Yum! 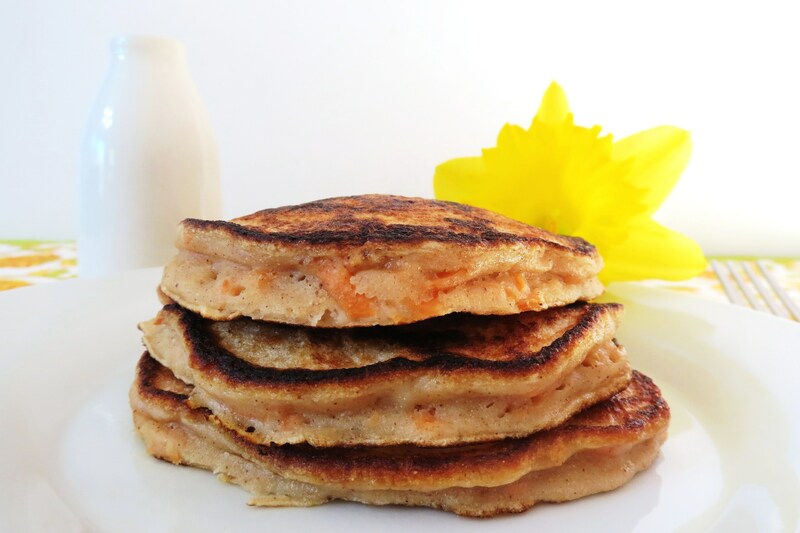 I haven’t had carrot cake in forever, but you know I love my pancakes! These sound incredible! What a great idea! I am looking forward to trying these, they sound so good! When I first saw these pancakes in Joy the Baker’s cookbook, I was absolutely hooked! But now I’m really antsy to make these. I mean that cream cheese topping slathered all over the tops of the pancakes is just screaming at me! Love these!! it’s like cake, but healthier! and totally acceptable for breakfast. How to have cake and frosting for breakfast..sweet. Totally justifiable with healthy carrots and dairy to boot. Perfect for breakfast and low on calories, can’t go wrong with that!! what an awesome breakfast! love this! Oooh, that looks so delicious 🙂 Great job on the frosting! Thanks Kiri! The frosting does make the pancakes! Oh my gosh. Yum! Seriously, they sound heavenly. I love carrot cake! The idea of getting to eat it for breakfast is so exciting! 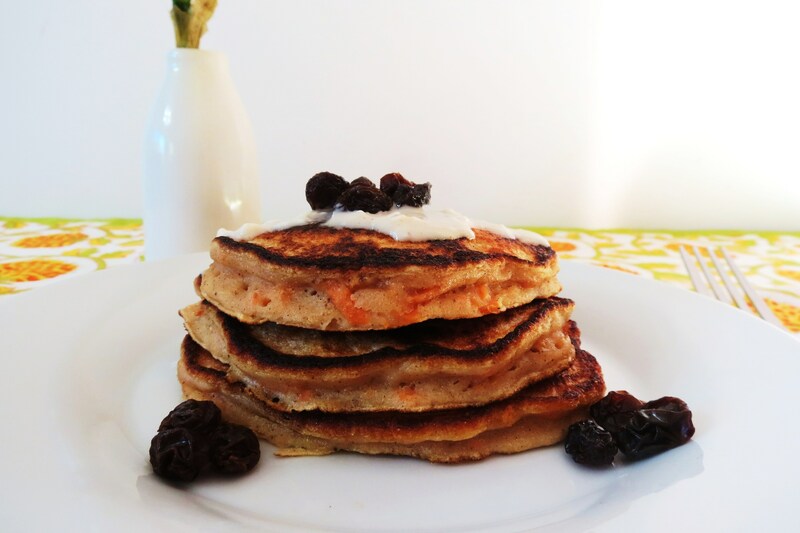 I love carrot cake to and this one is pretty healthy too!! This and those carrot cake waffles are genius for HRC posts! Really? Cream cheese frosting! That is genius. 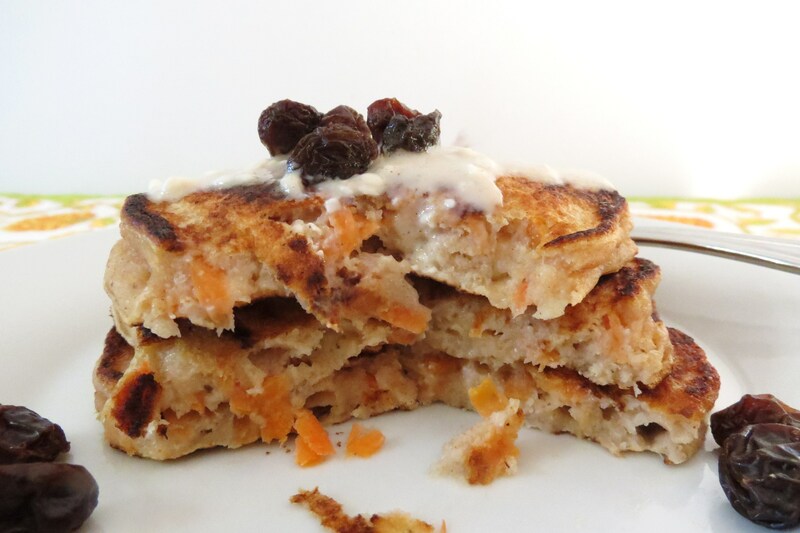 Your pancake posts make me crave breakfast… I love the carrots peaking out of the pancakes – perfect! I should make these and layer them with some liquid cheesecake..mmm.. Great post! Ohhh adding liquid cheesecake sounds amazing and perfect for the pancakes! The best special veggie recipe is creamy broccoli soup. In these days i cooked for my 5 guests. They really like my vegan meals. Ohhh yum! That sounds really good!